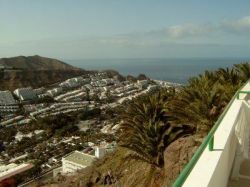 Welcome to the Scorpio Apartment, Puerto Rico in the South of Gran Canaria. My name is Chris Coates, I live in the UK and I have a 1 bedroom apartment available for private let. I hope you enjoy the site, and have a good stay at the Scorpio. The apartment is on a quiet complex and has its own panoramic views over Puerto Rico. 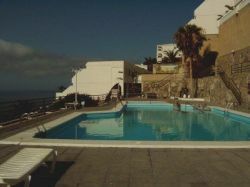 The complex is popular with couples who are looking for a relaxing independent holiday. It is within 15 minutes walk from the beach and 5 minutes walk from the Europa Centre, which has a choice of shops, bars and restaurants. A 5 minute taxi journey will take to Puerto Rico's bustling nightlife, where you will find a choice of bars, restaurants and various nightclubs. The apartment has brand new fittings and furnishings, with 50m2 of living area, plus a large balcony of 20m2. There is a washing machine, fully equipped kitchen with mini oven and microwave, fridge, fitted wardrobes, bathroom with shower, television and private balcony with easy access to the pool. Balance to be paid - Straight away to arrival.